The 100th anniversary has given us two books on Titanic's Canadian connections. 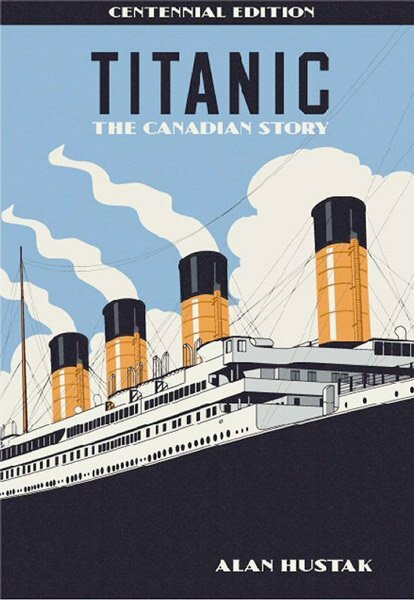 The first is the re-issuing of Alan Hustak's informative book, Titanic: The Canadian Story. 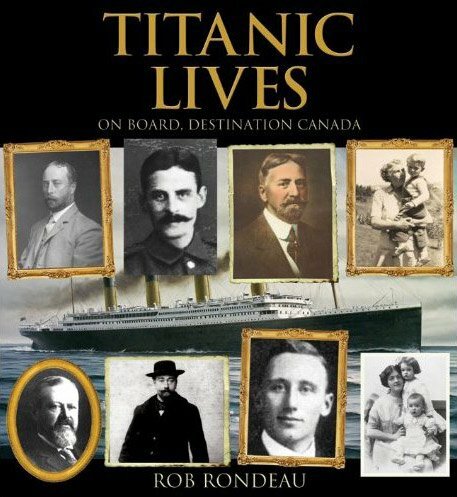 The newest one is Titanic Lives: On Board: Destination Canada by Rob Rondeau. Are they both worth buying? When Hustak's book came out in 1998, it was praised for it's new information and excellent photographs. Does the updated version have new information? Yes! Many new pictures not previously available have been added to the book. The publisher seems to have wanted large pictures, which means some are not as clear as they were in their original size. The new photos include Paul Chevre; Emile Richard; the Braund brothers (Lewis and Owen) ; Albert Mallet and family; Berthe Mayne; Mathilde Weisz, and so on. The rare photo of Mabel Fortune is not in the new version. The text is pretty much the same, but with corrections being made and a few new updates have been added. Covering almost every Canadian connection would seem an impossibility, but the author skillfully manages to tell the reader a little bit about each. There is the affair between Berthe Mayne the cabaret singer and Quigg Baxter the wealthy son of a Canadian widow; And Hilda Slayter, a woman coming back to Canada to be married. An amusing anecdote can be found in the book when Slayter's friend, Fanny Kelly, refuses to climb a ladder as she is not wearing underwear and is afraid people could see up her skirt. Her friend urges her to abandon her modesty and climb towards the lifeboats. The soon-to-be-married woman must have thought back on Kelly's presentiment at the beginning of the voyage, "But I know this ship is going to the bottom." Joseph Fynney, a rubber merchant known in his neighborhood for keeping company with young men, was traveling with an apprentice barrel maker named Alfred Gaskell. Joseph McCrie was hurrying home from working on an oil rig in Arabia to be with his wife and sickly children. The name Abraham Harmer appears on the passenger list, but, was in-fact, the newly married watch maker David Livshin. It was assumed he bought the ticket off a third party. Wealthy and poor, the author gives us a glimpse into their lives and why they are traveling on Titanic. Although the text is about 170 pages, one wishes it was a larger book. The author clearly has many interesting stories in his collection due to years of research. So many people are covered that accounts of activities on board tend to be limited to a few sentences. A few sentences talk about Frank Maybery's uneasy climb to the boat deck. Did a survivor note this and convey it in an account, or was this artistic license by the author? If it is the latter, it could have been excised in favor of an account like Ethel Fortune's. Hustak tells us as Ethel listened to the band play, she left her family during the evacuation as she decided it wasn't serious and went back to her cabin. It is told in two quick paragraphs. Interesting details like these could have been expanded upon. The author notes the irony of the Hickman brothers both being lost. Lewis wore his brother Leonard's coat that carried all of Leonard's identification. This led everyone believing Leonard had been recovered from the sea. William Harbeck was recovered with his mistress's purse in his pocket, much to the consternation of his wife! Lives changed after the disaster. Mabel Fortune married her suitor and had a son, but in a dramatic twist, Hustak reveals she left her husband to live with another woman! The wealthy Zette Baxter Douglas would spend her final years in very reduced circumstances. Paul Mauge, the sole male worker from the À la carte restaurant to survive would marry and live a long life in Montreal. A final story in the book covers the search for the identity into 'the unknown child'. Those who do not have this book should definitely buy it. It is a must for any Titanic book collection. Even if you have the first edition from 1998, the new photos and updated info will make it worth buying this version. Anyone who claims that there is nothing left to write about will change their mind when reading this book. Rondeau's book focuses on just ten passengers. One would assume that when writing about a smaller group of people, there would be many new details about them. Sadly, there isn't much in this book that you cannot find in Hustak's book. There are a few interesting tidbits such as the Allison family traveling with their friends, the McBrides on the Empress of Ireland to get to England. Charles Hays cutting his European trip short due to his daughter Louise's difficult pregnancy. New photos of an older Alice Fortune, Hudson Allison with his horse, Berthe Mayne posed by a chair. The book is mostly filler. One chapter that is supposed to be about steward William Edwy Ryerson is actually an overview of the Canadians in the Boer War. Very little is actually about Ryerson. The same can be said about the other people covered. The book focuses more on cuisine of the era, 1912 fashions, period cabaret performers like Collette and Mistinguette, panning for gold in the Klondike; brothels and saloons, Edward VII, etc... More attention is paid to these subjects than the people that the book claims to be about. So, really, this isn't so much a Titanic book, it's a book about the Titanic era with a very brief overview of a few passengers.